A good knife is a really great piece of camping equipment. Having a nice knife instead of a crappy one is like having a smartphone instead of a flip-phone: you were surviving OK without it, but once you have one you’d never consider going back. If you have a pocket knife, Swiss army knife, or hunting knife around the house, use that and see how it treats you. If you don’t, and are interested in getting something better specifically for camping, read on. tl;dr: If you want a folding knife, get an Ontario Knifeworks Joe Pardue folder, or an Ontario RAT1 folder, both about $25. If you want a fixed blade, the Schrade SCHF10 Extreme Survival model is a good bargain at $40, among currently available full-tang knives made from decent materials. Know that these are very different from most normal home kitchen knives, and are razor sharp when delivered- never cut toward your hands or toward yourself with one of these knives. What to look for in a good knife. SAFETY. The most important feature that a nice camping knife should have for me might not even be on the list for some people: it should make it hard for me to cut myself. Having a tiny, slightly lighter, razor sharp knife in my cold or wet hands, possibly far from medical attention, is just a great way to potentially have to end a camping trip early for someone to go get stitches, or worse, in my mind. Even among larger, less-clumsy knives, the designs often omit the forefinger groove (a little dent on the handle’s underside, for your pointer finger to sit in securely, so it doesn’t slip forward toward the blade), or the thumb rise (same deal on the top of the handle, to keep your thumb from sliding forward), or the jimping (a series of tiny dents in both of these spots to give some texture and improve your grip even more). If possible, I’d like a knife that keeps my paws well-separated from the pointy bits, even under crappy (icy, wet, cold) conditions. This also means that for folding knives, I need to know it won’t fold up until I tell it to. Durability. I also like a knife I can baton with. Batoning is when you use a stick to whack across the back of your knife, typically on the back of the blade just ahead of where it meets the handle, so you can split wood. It’s a very useful skill to know, and best learned in person, although I’m sure there’s no shortage of youtube videos. For fixed-blade knives, you want a full-tang knife, for batoning, and really for any use. The tang of a knife is basically the bit of the blade than extends into the handle- on a full-tang fixed blade knife, the entire handle has a delicious center of blade, all the way to the back end. If they haven’t made the handle so that you can see the metal center all the way back, it’s very unlikely to be a full-tang knife, regardless of what anyone claims in the fine print. Perhaps surprisingly, many good folding knives with metal frames can also be used for batoning if you keep in mind that they need a bit more TLC. The equivalent of full-tang for folding knives is an all-metal frame. The frame is the bit of a folding knife that the blade folds into- although there may be plastic or wood “scales” to give the grip its shape, the center layers of a good folding knife frame should be steel or titanium. Most folding knives have an all-metal frame, but a few discount models now have a polymer-only frame. Avoid these. While folding knives are inherently less sturdy than fixed-blade knives, I almost always camp with a good folding knife, and I’ve never had one let me down while batoning. I would definitely Google a review for any particular model you’re considering, to see if they tested batoning with it hands-on. (Trust me, someone has). As just mentioned, I (slightly) prefer a folding knife. That’s because the best knife is the one you always have with you in your pocket, not the huge Rambo knife that you left back in the tent or car. For much longer trips, or more extreme use conditions, the scales might tip toward the additional durability of a fixed blade. Your mileage may vary. Steels. There is a lot of ink (electrons?) spilled online about the type of steel a knife’s blade is made of. Most often, the type of steel is stamped or engraved directly onto the blade of the knife. Here’s a primer. Long story short, there are three rough categories in non-flea market knives: 1- old-school (some of which are outstanding), 2- new and nice but but not super-overpriced, and 3- new, slightly nicer knife-nerd steels that are only used in knives that cost an arm and a leg (ATS-34, 154CM among others). You’ve probably already guessed that the blades of the knives recommended here are all made of steels from the middle category- mostly AUS8 / AUS8A or 8Cr13MoV, to be specific. These are both stainless steels. I’ve seen a few knives sold in two identically named versions that are either AUS6 or AUS8; keep an eye out to be sure that if you’re looking at a knife like this, you get the AUS8 version. Serrations. Many knives that meet the requirements laid out here come in two versions- one with a smooth blade all the way to the hilt (handle), and one with the back part of the blade serrated with small indentations. Although many people imagine the serrations are for sawing, they’re not- a better tool for that is an actual saw. Serrations also need to be sharpened using a special tool, when they finally become dull. Nevertheless, after using many knives with and without them, I slightly prefer partially serrated blades. Here’s one example of the subtle things you can use them for when you get used to them: often you are trying to cut something spherical or cylindrical, that may also be slippery or wet. Starting at the serrated part lets the little points hold things for you, to get your cut started more safely. These blades are also all large enough that there is plenty of edge left ahead of the serrations. Although I lean toward the partially serrated option, almost all knives that offer a partially serrated edge also have an identical model with a smooth edge, if you prefer. Tip for the people who spend a lot of time on the web. Many knives that meet the requirements above are custom designs from knifemakers who are in high demand. These are out of our price range. Often, some well-known knife makers will agree to a limited mass-production run with a big knife company, which effectively makes their top-of-the-line designs available for cheap. These types of knives always go out of stock quickly. However, if you do a lot of web-surfing, you can get an amazing knife for around $30 by keeping an eye out for one of these. Recent past examples include the outstanding Timberland Kelley Worden, the CRKT Crawford Kasper, and the CRKT Jim Hammond Desert Cruiser. Basically, if the knife model has some dude’s name in it, that’s probably a good sign that it’s a decent knife, and also that it won’t be around in stock forever. If obsessively Googling custom knife designer names isn’t your idea of a good time, there are a few great production knives that more than meet our requirements without breaking the bank. Read on. Recommendation: For a good bargain on a great folding knife that’s in production, I would first pick the Ontario Knifeworks Joe Pardue Utilitac II model, with the partially serrated blade, for $25. Because it has some dude’s name in it, it may not be around forever! A very similar non-signature model is the Ontario RAT1 partially serrated. The RAT1 is also available with a black-coated blade, if that’s your thing (enjoy looking for it at night if you drop it!). Both of these knives have an AUS8 stainless steel blade and a metal frame, with a nice grip design. If you prefer a more sturdy but bulkier fixed-blade knife, there are fewer bargain options out there that have a full tang and decent steel, but the Schrade SCHF10 Extreme Survival for $40 stands out among currently available models. It has a full tang 8Cr13MoV blade, and a great grip design. There isn’t a comparable Schrade model without the black “ninja” coating of the SCHF10, so you’ll have to go full-ninja if you want to rock this excellent bargain camping knife. First knives. Although I think the larger knives described here are actually much safer in an adult’s hands than something tiny, for kids the opposite may be true, and this is certainly most people’s perception. If you have a smaller-handed young knife user who has thoroughly learned knife safety , a nice starting tool is the Victorinox Huntsman Swiss-Army knife. Although you can save $10 or so by getting one at Amazon or on ebay, a place like Swiss Knives Express or Swiss Knife Shop will offer handle engraving for free, and kids love things with their names on them. 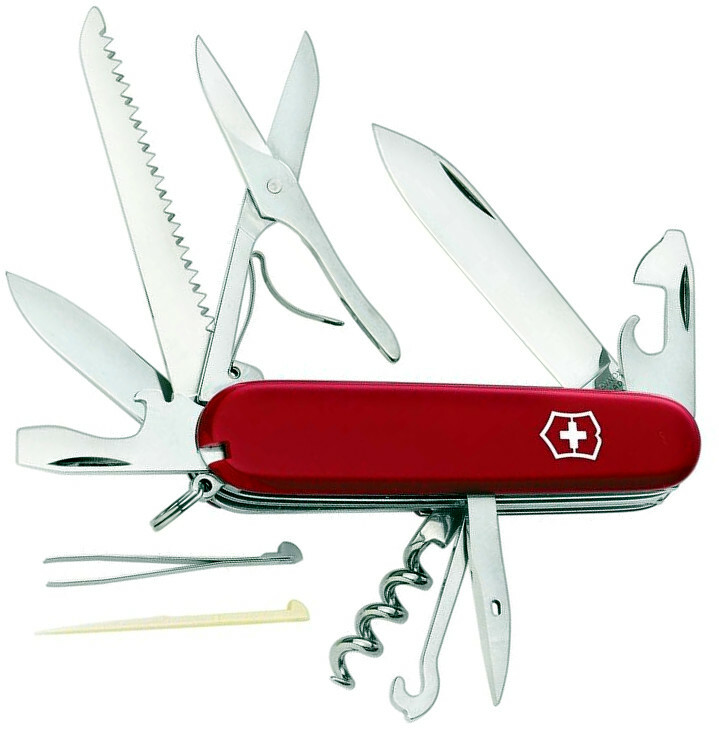 The steel in Swiss army knives is much softer than in the other knives recommended here. This means it’s much easier to bend or break these by treating them too harshly, and it also means that they’ll need to be sharpened more often. The Huntsman is also a great adult backup knife for camping, because in addition to a small but very usable knife, it has excellent sharp scissors, a can opener, small saw, corkscrew, awl, bottle opener, and tweezers. Sharpening. Sharpening camping knives may be new to you if you’ve only honed kitchen knives on a metal rod until now. 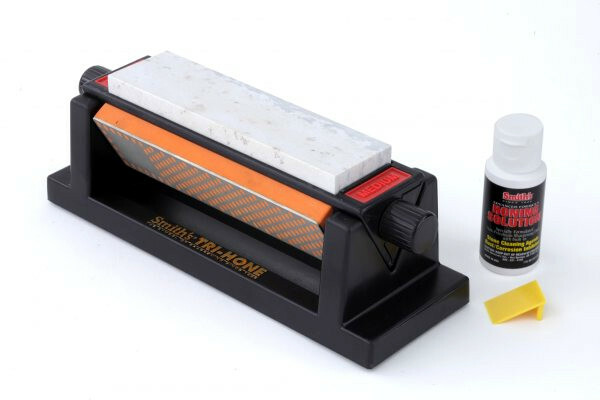 There’s more than one school of thought on the best way, but here is one place to start: the Smith’s TRI6 Sharpening Stone system is meant for beginning knife sharpeners, and contains an angle guide. It comes with everything you need, for $27. Is it the best of all possible sharpeners? No. Is it great for beginners, close to as cheap as you can get, and good enough to put a razor edge onto a camping knife quickly? Yes. Depending on which edition you get, the stand that comes with this sharpening set may have a slick bottom- if you find it slipping around on the table during use, set it on a towel.